"A powerful but compact garage heater for up to 600 square feet." "Excellent performance and plenty of heat." "Can heat close to 1,000 square feet with no problem." "Will keep you warm wherever you go." "Fast heat and easy installation." If your space is small but cold, you need a garage heater that delivers big results. The Hot One by Cadet is a powerful but compact garage heater for up to 600 square feet. At just 17 x 15, this heater is built like a tank according to users. It features 20-gauge steel construction with a powder-coat paint finish for durability. This bright red heater is also red hot, thanks to its ability to generate 4,000 watts of power for heating up your space. Keep in mind that this is a small but mighty unit and it requires a 240V outlet—your standard 120V residential outlet won’t work. After plugging in this garage heater and turning it on, people find that their small garage or workshop is efficiently heated by these quiet units. One person describes it as “built like a tank” and able to stand up to the cold of Minnesota winters. Even on low, people have found that the heater delivers plenty of power to take the chill off. Choose The Hot One by Cadet if you’re looking for commercial grade durability in a compact, efficient garage heater that is perfect for small spaces. For a garage heater that offers excellent performance and plenty of heat, our top pick is the Fahrenheat 5,000-Watt Electric Heater. This ceiling-mounted garage heater will stay out of your way while keeping your garage or workshop warm and toasty. This reliable electric garage heater is fairly compact, measuring just 13 x 14 x 18. It has an adjustable mounting bracket that allows you to position the heater for horizontal or vertical airflow. A favorite feature of this garage heater’s design is the fact that the fan action is delayed until the heating element has warmed up—meaning no more cold air being blown on you while you wait for the warm air to kick in! An adjustable dial allows for temperature adjustment between high and low, but the manufacturer describes the range as being between 45 and 135 degrees Fahrenheit. Since this is a ceiling-mounted garage heater, several people mention that including a remote-controlled thermostat would make it easier to adjust the temperature. But this hasn’t been enough of a drawback to stop people from purchasing this highly-rated garage heater. You will need a 220V outlet to power this 5,000-watt garage heater capable of producing up to 17,065 BTU. Turn up the heat in your 2-car garage with a powerful heater like the Dyna-Glo Delux. This propane-powered forced air heater can heat close to 1,000 square feet with no problem. Rated for both indoor and outdoor use, this heater produces 40,000 BTUs when connected to a propane cylinder. The Piezo ignition makes it easy to start and you can adjust the angle to send the heat right where you want it. Another unique feature on the Dyna-Glo Delux is the low pressure 0.5 PSI heater. This low-level pressure system allows the unit to more consistently produce maximum BTU output and can be safer if a leak develops. Keep in mind the Dyna-Glo Delux delivers very hot air, right away. Reviewers often point out that it's important to follow the operating and safety instructions. While it is a little noisy, this heater can take your 2-car garage from icy to warm in no time. In fact, many people have commented that this garage heater raised the temperature in their garage to anywhere from 50 to 70 degrees—even in the dead of winter. It also has been used with good success in uninsulated garages, thanks to its ability to continuously produce a stream of warm area. For heat that you’ll feel in a hurry, look for an infrared heater like the 5,600-watt Dr. Infrared DR-988 Heater. Infrared heaters first heat people and objects in the space before beginning to warm the air. This model from Dr. Infrared is capable of heating garages up to 600 square feet, and people report that it can raise the temperature to 60 or 70 degrees Fahrenheit within a couple hours or less. The fan mechanism also does a great job of circulating air in the space, helping to maintain a stable temperature throughout your entire work area. Some users have reported only a minimal temperature difference of less than 1 degree in their garage space when using this heater. Another standout feature of this infrared garage heater is the fact that the housing doesn’t become too hot to handle. If you are working near the heater or need to move it, it won’t burn you like the metal housing of some other garage heaters. You will need a 220v outlet for this infrared garage heater to be safely plugged in and operational. Even without electricity, you can have a warm and toasty garage thanks to a natural gas heater—like this Vent-Free Dual Fuel Garage Heater from Blue Flame. With a powerful 30,000 BTU output, this garage heater runs on natural gas or liquid propane. 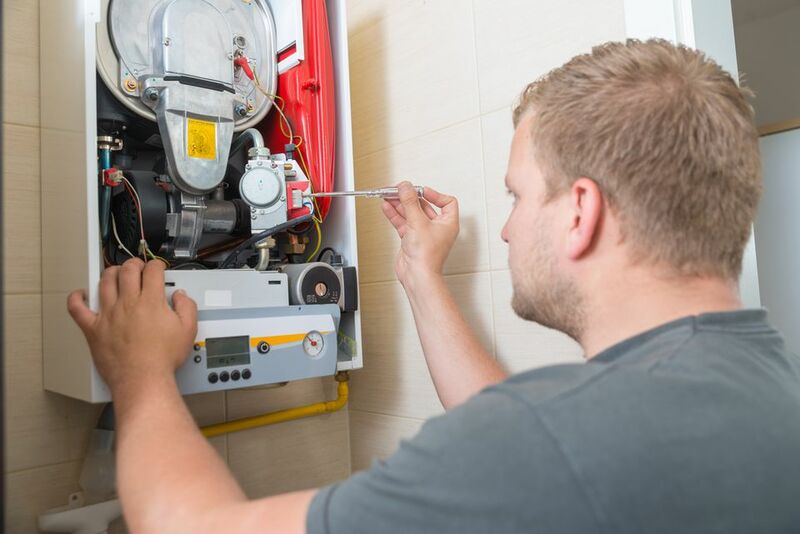 Whether your workshop lacks electrical wiring, experiences frequent power outages, or you’re just trying to reduce electricity consumption, a natural gas garage heater will offer you reliable, efficient heat. This wall-mounted garage heater is capable of heating up to 1,000 square feet— making it perfect even for bigger multi-car garages or expanded workshops. It should be noted that it will perform best in structures with at least some insulation. If you’re looking for a low voltage option for heating your garage, the DeLonghi Mica Panel Heater is a quiet, efficient choice that only needs a standard 120V electrical outlet. While many higher-output garage heaters require an outlet with 220V of power, the Mica Panel Heater is a home heater that can easily cross over into garage or workshop use. The casters on the frame make it easy to wheel it next to your workbench or you can also mount it to the wall for heating a specific area. One thing that people often point out is that this heater is very quiet. Many people say that it’s easy to hold a conversation even while the heater is operational. It’s safe to say that your power tools will be noisier than this slim, low-voltage garage heater. Bear in mind that the lower voltage of this heater also means less heating power—so don’t expect it to transform your arctic garage into a tropical oasis. Still, it can take the chill off your work area and make you more comfortable on cold winter days. Make sure you always have a handy heat source with a portable garage heater. This is a great way to stay warm if you spend time in your garage, workshop, barn—or all three! The Mr. Heater MH9BX Buddy is our pick for a portable heater that will keep you warm wherever you go. Instead of a large, installed unit that only radiates heat from a single location, a portable heater like the Mr. Heater MH9BX Buddy can follow you wherever you go. Keep it close by so that you really feel the warm air on the coldest of nights or take it with you when you move from the garage to an outbuilding or shed for more work. Running off a 20-pound propane cylinder, this portable garage heater isn’t limited by the availability of an electrical outlet. It also has a high-efficiency rating and burns clean. While many people are very happy with the performance of the Mr. Heater MH9BX Buddy, it has been noted that it can be a little tough to ignite pilot light at first. The built-in O2 sensor helps to ensure that air quality remains safe. If you want to warm up your garage without burning up your cash, a budget garage heater that is also efficient is a smart choice. The Optimus Garage Utility Heater may not be the most powerful garage heater on the market, but it offers fast heat and easy installation. This inexpensive garage heater provides anywhere from 600 to 1200-watts of power to heat your garage, workshop, or shed. The unit uses a quartz heating element and halogen lights to keep your work area illuminated. Note that the lighting function can’t be turned on and off separately from the heater, which has been a drawback for a few people. While this isn’t the most powerful garage heater on the market, it works great for a budget-friendly way to keep the space reasonably comfortable during cold weather. Some people choose to install two of these garage heaters for extra heating power, but most users find that one unit does the trick. After several years, some components start to fail on the heater—most notably the pull-cord that turns the heater on and off. Still, for the price tag, you’ll get your value from this budget garage heater. Our writers spent 3 hours researching the most popular garage heaters on the market. Before making their final recommendations, they considered 16 different heaters overall, screened options from 12 different brands and manufacturers and read over 100 user reviews (both positive and negative). All of this research adds up to recommendations you can trust.